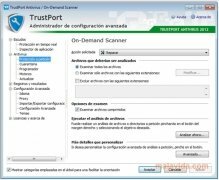 TrustPort Antivirus is a complete solution for the security problems that your computer can suffer, like for example, a virus, spam, spyware, phishing problems, etc... It detects threats on your hard drive, on the websites that you visit, and in the email and its attached files. It's a very complete antivirus, because it includes various scanning engines that assure a higher reliability when it comes to detecting and eliminating threats. This protection is completed with its heuristics search engine that is capable of detecting recently created malicious software, thanks to the database's frequent updates. 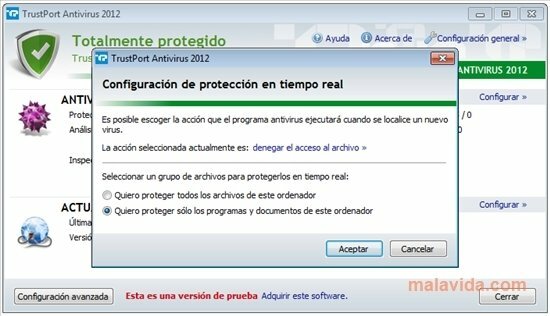 - Residential protection, to overlook files that have been opened recently. - Selective scanning, to scan all the hard drive or only the files that we choose to scan. - Email antivirus, that scans the inbound mail for malware. - Antispam module, that blocks unwanted mail. - Internet antivirus, that protect you while you browse. - Parental control, that blocks the websites that we tell it to, so that we can protect our children.